The $1.2 million Carbon Online Poker Series may be over with. But players certainly don’t have to wait long for another major event at Carbon Poker. That’s because they’re set to run the Micro Online Poker Series from March 23rd-30th, 2014. 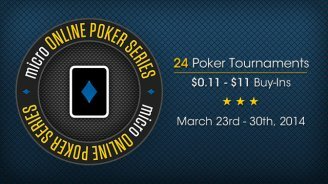 Like any great low buy-in tourney series, the Micro OPS is very affordable for the average player, with buy-ins ranging from $0.11 – $11. And you can expect plenty of variety among the 24 tournaments, with Hold’em, HORSE, PLO, PLO Hi/Lo and HA (alternates between 10 hands of Hold’em and 10 hands of Omaha Hi) all on the schedule. Every day of the Micro OPS will feature at least three tournaments, and you can buy into events with cash, VIP Points or tourney coupons. Carbon run lots of daily coupon satellites, so if you’re dealing with a very limited bankroll, you can still get in on the $5.50 or $11 buy-in events. Now, let’s move on to the Micro Online Poker Series schedule.